Shop online for 186 evergreen model trains at discounts up to 36%. This Package Contains Eight 1/16" White Styrene Plastic Round Rods from Evergreen Scale Models. This is a Package of Ten .020 x .100" Styrene Strips from Evergreen. They are for experienced model builders. This Package Contains Seven .100" x .188" White Styrene Rectangular Strips from Evergreen Scale Models. This is an Assortment of Rods and Tubes by Evergreen Scale Models. This Package Contains Ten .060" x .125" White Styrene Rectangular Strips from Evergreen Scale Models. 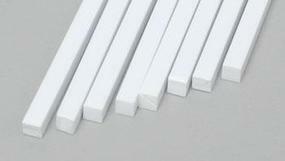 This Package Contains Six .125" x .125" White Styrene Square Rods from Evergreen Scale Models. This is a Package of Five 1/8" (.125 Dia.) Styrene Tube Strips from Evergreen. They are for experienced model builders. This is a Package of Six 3/32" (.093 Dia.) Styrene Tube Strips from Evergreen. They are for experienced model builders. There are 4 StripStyrene .060" Angles Within This Evergreen Scale Models Package. This is a Package of Four 5/32" (.156 Dia.) Styrene Tube Strips from Evergreen. They are for experienced model builders. 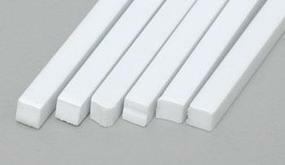 This Package Contains Six .080" White Styrene Plastic Round Rods from Evergreen Scale Models. 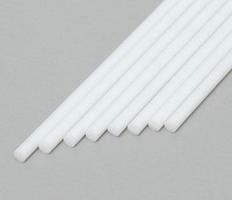 This Package Contains Ten 3/64" White Styrene Plastic Round Rods from Evergreen Scale Models. There are 4 StripStyrene .080" Angles Within This Evergreen Scale Models Package. This Package Contains Ten .030" White Styrene Plastic Round Rods from Evergreen Scale Models. This is a Package of Ten .030 x .100" Styrene Strips from Evergreen. They are for experienced model builders. There are 4 StripStyrene 1/8" Angles Within This Evergreen Scale Models Package. This Package Contains Six .100" x .250" White Styrene Rectangular Strips from Evergreen Scale Models. This Package Contains Four 1/8" White Styrene Plastic Round Rods from Evergreen Scale Models. This is a Sheet of .040 Styrene with 1/2" Squares Sidewalk Design from Evergreen Scale Models. For experienced model builders.